Market3 is happy to have relaunched American Asphalt Company’s newly redesigned WordPress website. American Asphalt of Collingswood Heights, NJ is one of the leading paving companies in New Jersey and one of the largest in South Jersey. The company specializes in paving, manufacturing, and maintaining asphalt services. With a team of highly skilled and experienced professionals, they manage every aspect of a project, from the use of quality materials, to building and maintaining roadways and parking lots. 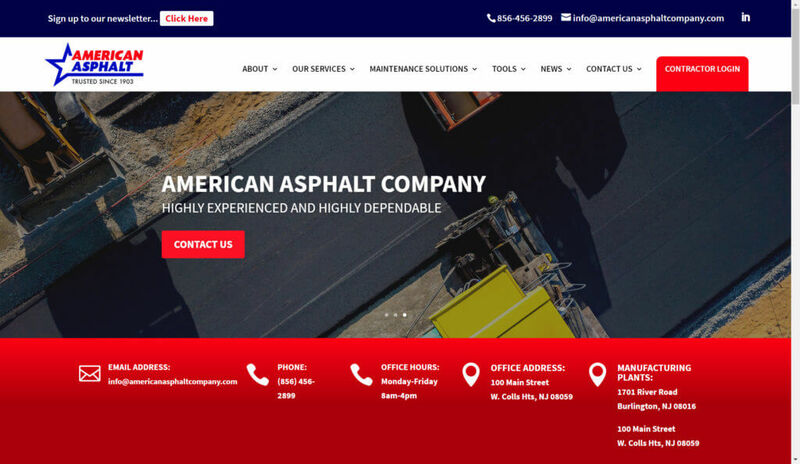 As a former client of ours, American Asphalt Company understands the importance of a quality web presence. This is what sparked the company’s desire to have Market3 redesign their website again, making it better than ever before. With the client in mind, Manna created a website that is more user-friendly and focuses on showcasing American Asphalt Company’s quality services to appeal to existing and potential customers more. Customizing American Asphalt’s website on WordPress means giving the client full updating capabilities through CMS (content management system). American Asphalt has the ability to upload media files, such as photos and videos, and update web content such as copy on various pages. These skills, along with many more, are taught to clients by one of our New Jersey web design team members in training session after launch. In addition to CMS, American Asphalt Company’s new website has other features like a responsive design. This makes it compatible with all mobile devices; an important factor considering most web visitors are on their phones. The site’s jQuery slideshow also works with iPads, iPhones, smartphones, and tablets.